Announced by Minister Navdeep Bains at the Canadian Telecom Summit in Toronto, the Connecting Families initiative brings together seven Internet Service Providers (ISPs) across the country — Bell, Cogeco, Rogers, SaskTel, Shaw, TELUS and Videotron – that are partnering with the Government of Canada to offer low-cost service to eligible households. The initiative is set to run until 2022 and CFSC will develop a secure online portal that will enable eligible low-income Canadian families to access the $10 per month high speed Internet service from participating Internet Service Providers while protecting their privacy. Up to 50,000 computers will also be made available to eligible families through the Computers for Schools program. In collaboration with the Pinnguaq Association in Nunavut, CFSC is overseeing a project that will enable communities to participate in the “Te(a)ch” program, which teaches coding, computer science and game design to youth. In this pilot CFS Nunavut program, CFSC will enable the roll-out of laptops and onsite training through Pinnguaq. The pilot goal is to establish a sustainable and inclusive network linking communities across Nunavut. Every day hundreds of homeless shelters and service providers across Canada are using the Homeless Individuals and Families Information System (HIFIS) software to register, book in, counsel and help their clients. CFSC coordinates the delivery of refurbished computers to these organizations through the CFS program. 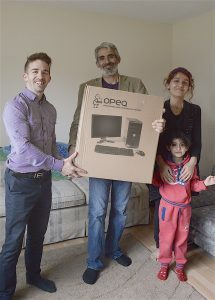 In 2016, CFSC coordinated the efforts of Innovation, Science and Economic Development Canada (ISED) in delivering 7,500 refurbished computers to Syrian refugees in Canada. The computers, which were distributed by various refugee and immigrant support organizations through the CFS program were provided with donated licenses from Microsoft to run Windows and Office, ensuring that new Canadians can take advantage of all the opportunities in Canada’s digital society. Giving the gift of computer literacy is as valuable as learning English. It is imperative to integration and success, and Computers for Schools is to credit for this very fundamental life skill. The families to whom we are able to distribute the computers are families with children who have used them for school work while adults have used them to find employment, housing or education opportunities. Others who had never learned how to use a computer and are now able to learn a new skill.